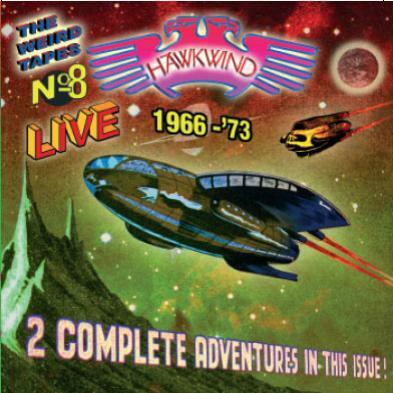 Hawkwind - "The Weird Tapes No. 8"
I am really not sure why it took years for this, the last Weird tape to be released, but it is out now. The other 7 Volumes were released in 2000 and some became quite hard to get and are out of print, I believe. Anyway, this features some of the earliest stuff and although it is called Hawkwind, it is actually Dave Brock playing with some of his pre-Hawkwind blues bands. There is indeed some really great stuff from the early 70's Lemmy era Hawkwind with an alternative version of Space is Deep from the 1973 Space Ritual Tour, which starts this CD off. Down on her Knees is next and it says location and date is unknown. The sound is hard to place but it does not sound like Huw on lead guitar and there are two guitars so it could be the 1970 line up with Mick Slattery on guitar? Next up is Live and Let Live, live from the US tour 1973, it appears. A very spaced out piece of stoned music. The middle portion of the CD is the blues stuff recorded between '66 and 68'. The last two tracks are in mono and recorded in 1971 (Dreaming and Shouldn't Do That), both audience recordings it appears. This is for the Hawkwind collectors for sure.